Blog 7/Week 7: “Study Week”. Definitely not a holiday for me. – Bloggity of my inner thoughts. Blog 7/Week 7: “Study Week”. Definitely not a holiday for me. As you can see by the title of this blog, I have no classes this week as Week 7 at College marks Study Week. Even though I usually treat this week as a way to relax and compose myself, I still saw it as a normal week of classes (I still came in twice for team meetings and to do work). I couldn’t really give myself a breather as I know that I still have a lot of work to do. 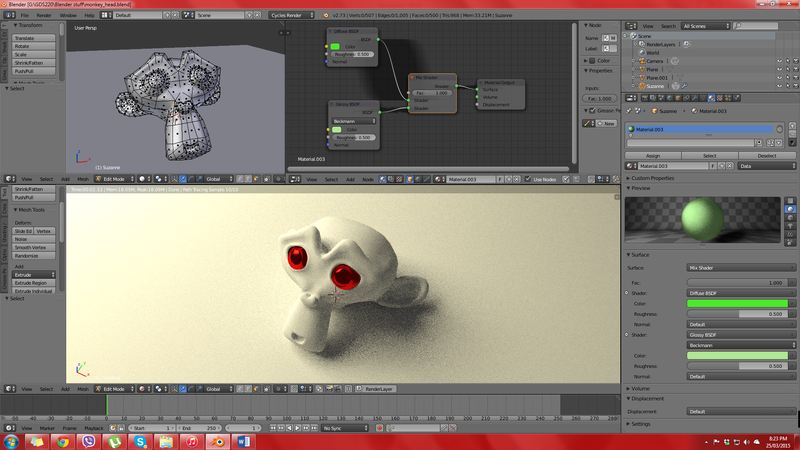 So in regards to tasks I had to do this week, I mainly focused on 3D Modelling Development and Research. What that mainly consisted of is numerous amounts of research in using Blender which is what the designers of our team have decided to use to implement the 3D assets. I have been watching many Youtube tutorials and taking pieces from each of them that are beneficial to what I am working on, evidently applying what I’ve learnt so far with creating 3D assets. 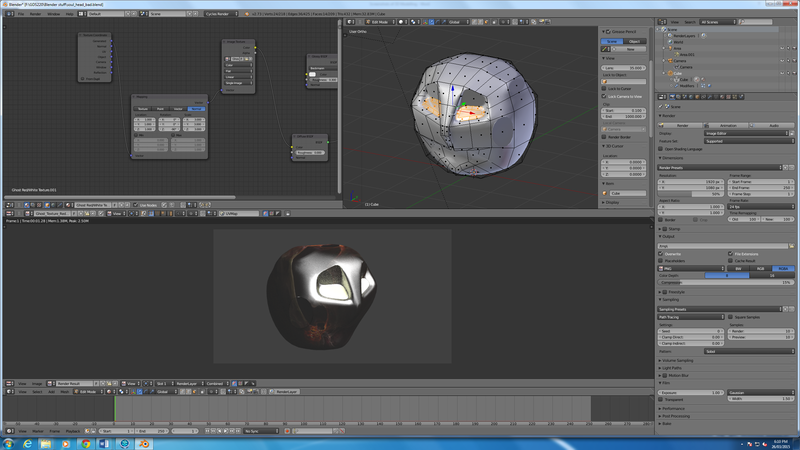 This is still an ongoing process as 3D modelling doesn’t come naturally to me. One of the tutorials I watched and really helped as it showed me how to alter a cube into a circular shape as opposed to using a normal UV sphere. This was really handy for one of the models I have to create and using that particular shape and extruding it I found very suitable. This screenshot is taken from another tutorial as it shows how to add lighting as well as colour to the model using nodes which I found very interesting and useful since I didn’t know there was more than one method to apply different textures/materials to 3D models. 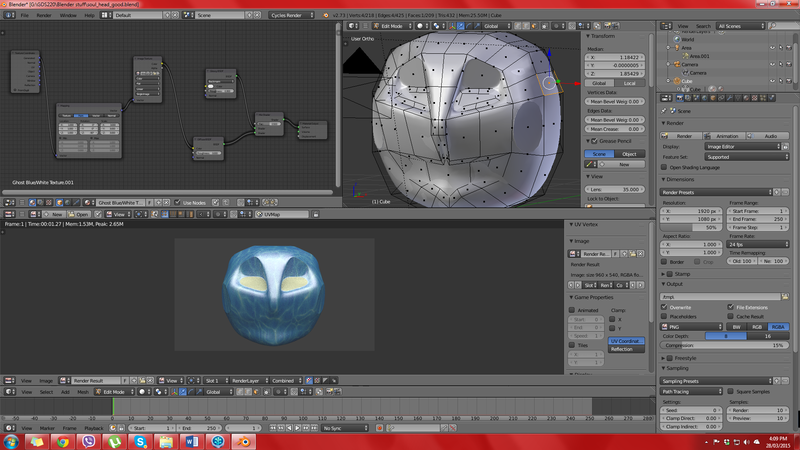 Once I began creating my own 3D assets for our game, I started with the creation of a soul 3D model. I will use this model as basis for other types of souls there are more than one kind of soul (good, bad and lost souls). The textures on these are not final, I just applied these textures just to distinguish them. I’m still having trouble with the lighting on them as they appear kind of dark in some places, I’m still trying to figure out how to import them into Unity, texture and all. Hopefully it will work, it’s just a little frustrating that this task is taking longer as it should be. I will create the lost soul model soon, it’s just a matter of applying a different texture on it as I did for the others. I was planning on getting the creation of the Minion 3D models underway but it might be a while till I get to that point, I still have to finish the Souls before moving on to the Minions. Oh if only I was just as gifted in 3D modelling like the animators in my college, this would be second nature to them I reckon. Well fingers crossed that I get the majority of this task done before class resumes next week.